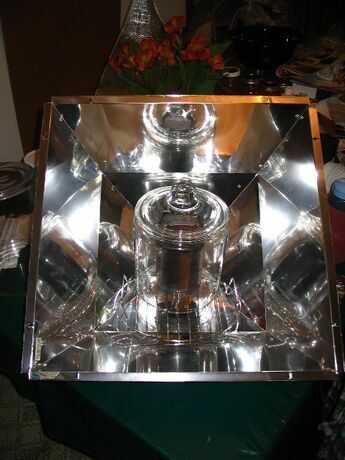 ï»¿ Solar Cooking Archive Discussion Forums :: View topic - Light Fixture Cooker! Posted: Sat Nov 10, 2007 1:29 am Post subject: Light Fixture Cooker! A friend of mine, who was very impressed with my demonstration at the Barter Fair, was visiting her brother back east. He makes his living recycling and salvaging items from contstruction, remodeling, etc. He had a pile of these large, tapered-square aluminum light fixtures with a mirror finish on the inside, and Dottie (smart girl!) was quick to see their potential. He would only have gotten about sixty cents apiece for them and was happy to give her a pile, which she split with me once she got back to the PNW. I have nine of these things. What a windfall! I've only had one day since with enough sun to be worth trying (barely), and it almost got a jar of fruit done (apples were mostly softened but not the quince bits) on a northern November day with maybe 50% sun at best. It may not have the fancy angles of a Cookit or HotPot, but I'm sure that in good sun it will cook food just fine.... probably at least a couple of quart's worth and maybe more. Pretty cool piece of recycling, but now I am haunted by the thought that thousands of these items may be in the process of being melted down for scrap, when they could help so many people just as they are! (I did ask Dottie to ask her brother about that possibility.) IIRC they were from a school that is switching to more energy-efficient lighting than these 400W fixtures provided. The edges were very rough, so I covered them with metal tape (duct tape would work, too), but other than that all they need is a rack, pot (or cooking jar), and pot-cover to be ready to go! That is really cool! That reminds me that the old satellite dishes that I find in the alleys aren't the only thing one can look for to reuse/recycle for solar cooking. I'm wondering if one couldn't slice up some Thermax or even layers or cardboard around it and make it into a box cooker? I'm glad I checked in (I wish the feature that is supposed to email you when there are responses was working!). Actually I turned it into a semi-oven hybrid last Saturday (the first completely clear day in weeks, but well under freezing). I was using a small black pot, which was full of apples for applesauce, enclosed in one of my favorite oven-bag alternatives, a clear glass casserole bowl on the bottom with a clear acrylic bowl (upside-down) on the top. Then I slit open a turkey sized oven bag, to make a piece large enough to clip over the whole opening of the light-fixture cooker, to give it an extra edge in the cold. If the clouds had held off about one more hour, my apples would have gotten cooked/softened enough. It didn't, so they only got about halfway done,but the temperature inside the bowl enclosure reached almost 225F, the temperature inside the light fixture(but outside the bowls) reached 150F,and the apples got to about 145F (starting from about 51F) in two or three hours. Pretty good for December 8 at about 47 degrees north latitude! And that was without any insulation! I took some pictures but haven't managed to get them into my computer yet. I'll post one or more when I can. It was a pretty effective set-up.